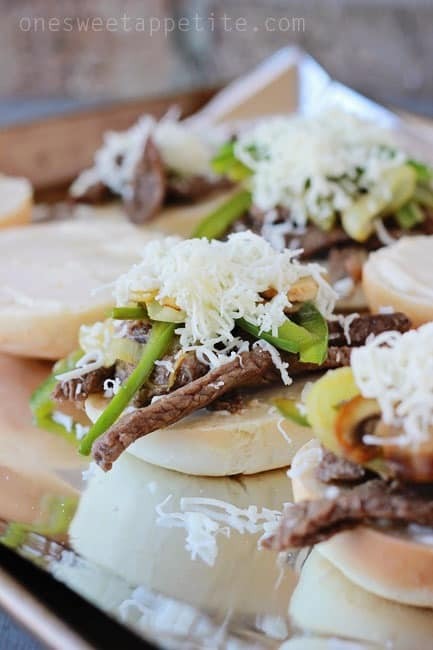 Show of hands… Who loves a good Philly Cheesesteak??? Ok, so I can’t really see you, but I’m going to assume every single one of you got a little excited and at least thought about lifting your arm into the air. The first time I flew into Philadelphia the friend that picked me up drove me straight to Pat’s and forced me to try one of their amazing sandwiches. I’ve been trying to replicate something similar in the past but can’t get any of my recipes to compare. I dream about us sitting in the car stuffing our face with the cheese and meat filled goodness. I decided to give this recipe a try (even though I know it veers away from a traditional cheesesteak in many ways) because the reviews were all excellent. 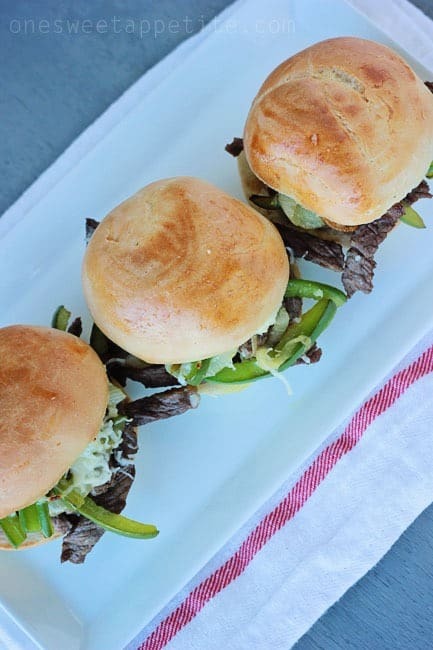 I love the idea of a slider because you could portion control. You know… If you are into that type of thing. They were tasty and easy to prepare, but still leave me dreaming of Philly. Maybe now that I’m on the east coast I’ll drive up that way just for lunch… I’m sure my husband won’t mind the 14 hour car trip! Heat the oil in a large pan. Add the steak and cook until it’s lightly browned. Toss in the peppers, onions, and mushrooms. Cook until the veggies are soft and the onions are translucent. In a small bowl combine the mayonnaise and garlic. Slice your rolls in half and spread with the mayonnaise. Top with your meat and veggie mixture and a slice of cheese. Broil for 3 minutes or until the cheese has melted. 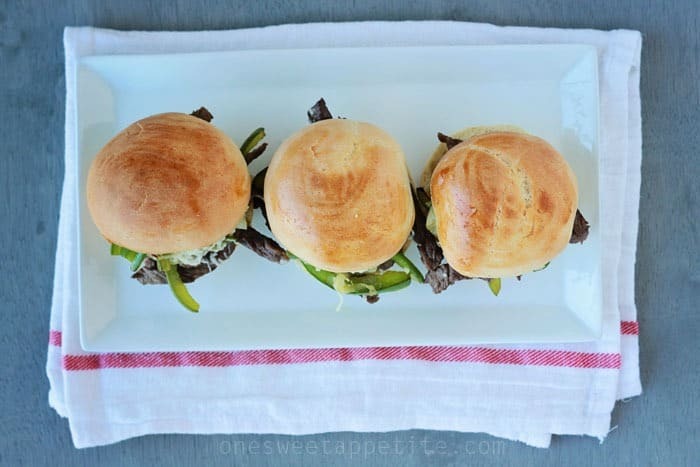 *Try my quick 40 minute hamburger buns! One of the things I love about this recipe is that it’s a one pot meal. Everything is done at the same time and easy assembly. My little picky eater loved the American cheese while I was a fan of the provolone. Either way you can’t go wrong! You know what? I don’t think I’ve ever had a Philly cheesesteak sandwich! These may just change that – thanks for the yummy recipe!